Fenwick McKelvey is an Assistant Professor in the Department of Communication Studies at Concordia University. He specializes in research on the fields of communication and journalism. More specifically, Professor McKelvey is examining questions of the algorithmic media, internet traffic management, internet policy, and governance. 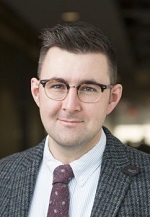 In addition, he has been working on research investigating the use of campaign management sofware in political campaigns in Canada and the US. The 2015 Canadian federal election campaign may be remembered most of all for its "candidate controversies." In an almost daily ritual, citizen bloggers exhumed the "unacceptable" words of candidates from their social media accounts, the press reported, the shell-shocked political parties responded, the citizen bloggers responded to the responses, and everyone suddenly found themselves pulled, perhaps unknowingly, into an implicit seminar on Canadian values. Had what these candidates said online been un-Canadian? As of yet, no one has seriously explored the ramifications of this remarkable element of the campaign. What effect did all these attacks, responses, and counter-responses have? It is the hypothesis of this research that social media has had, and will continue to have, a chilling effect on the expression of personal values in political life. The more social media becomes the central pillar of our public sphere, the more political candidates become constrained in the values they are permitted to possess or communicate, and this will, in turn, have a devastating effect on the proper functioning of representative democracy in Canada. We need to better understand the nature of the discourse on Canadian values that coalesces at the intersection of politics, journalism, and social media. Only by examining these dialogues, knowing how they function, and exploring the rhetorical methods they employ to create and maintain the illusion of consensus can we uncover the effects this sort of discourse may have on our ability to know and communicate our values in the public and political sphere. My thesis will trace and reconstruct the web of communications that emerged during the campaign between two citizen blogs, The True North Times and Some Random Political Blog, and various Canadian news articles. It will examine the responses, including punitive actions or lack thereof, from the political parties. It will pursue the lines of power within these communications to ascertain who precisely had the final say on what a proper Canadian value is, and how that party legitimized or enforced that claim. My goal, ultimately, is to discover which values were expressed, which were silenced, who had the power to determine the status of those values, and what sort of discourse that party used in the employment of that power. I will use as foundation the existing scholarly literature on the effect the evolution of communications technology has had on representative democracy in Canada (Carty, 1996; Fletcher, 1994; Anderson, 2006; and Doughty, 2014), and my knowledge on discourse analysis. I will use the coding system I created for my undergraduate research, and apply it to my new research, focusing on rhetoric coming from the citizen blogs, the media companies, and the political parties; my hypothesis is that, through this web, a consensus on Canadian values was enforced by means of which we would not approve, and by parties to whom we would not consciously or deliberately give such power. This issue is not about to go away, and given the rise of identity politics in Europe and the United States (not to mention Kellie Leitchs Conservative leadership campaign here), we should all fully expect the next Canadian election(s) to be even more fraught with these debates than the previous one, with both values and social media playing an increasingly determining role. My research into the phenomenon of the 2015 candidate controversies will add essential knowledge to our understanding of the changing nature of political communications in an age of social media, and the effect those online communications will continue to have on the outcome of our democratic processes.